A Blonde Among Brunettes: Food Blogger? Everyone knows I love food and love to cook. Not that I will be a food blogger, but I would like to dabble with it. Here is an attempt. At the bridal luncheon at the Glennwood Village Tearoom, we had 3 scoops of chicken salad and a delicious biscuit. The chicken salad was full of pecans and celery, which is great if you like that sort of thing. The celery was largely chopped, read: easy to pick out. The pecans were more finely chopped, read: unavoidable/impossible to pick out. But really, the pecans weren't all that bad. It added the texture and crunch that I took out with the celery. The salad itself was great, not very mayonnaise-y. There was also a granny smith apple slice on the side, which added a sweet, juicy crunch. The biscuit. I can't even begin to describe how delicious it was. It didn't even need butter. It was served warm. It was almost a cheddar biscuit, but not. It had a hint of garlic that was perfect. Basically, in one word- yummy. 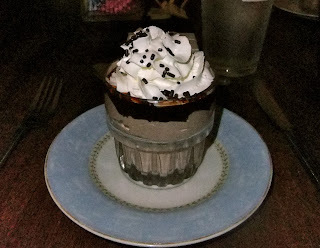 For dessert we had Chocolate Kahlua Mousse. Again, one word- yum. A dark chocolate thick, yet fluffy, kahlua mousse. Then drizzled with chocolate syrup, which was a little off putting, because it tasted like straight Hershey's. It was very rich so I couldn't finish it all, but it was still yummy.